We've been having the strangest weather here in NYC. One day we had wet rains, the next it was 60 degrees and sunny (giving us a glimmer of hope for spring days), and today we have a mini blizzard. Is the weather reflecting our country's political climate of opposing forces clashing?! I am quick to make this association between the two types of climates because living in the city, activism is knocking at every door from every front. It's a good thing. People are using their voices to say what they believe in. It's refreshing because in this country, people define themselves by their careers, their socio-economic status, their image, etc. I feel like more and more I am seeing people placing their identities in caring for their fellow human beings -- sharing in this human experience. That is why we are here, to take care of each other. When I'm not thinking about the state of this country (rare these days) I am keeping up with my various hobbies aside from design. 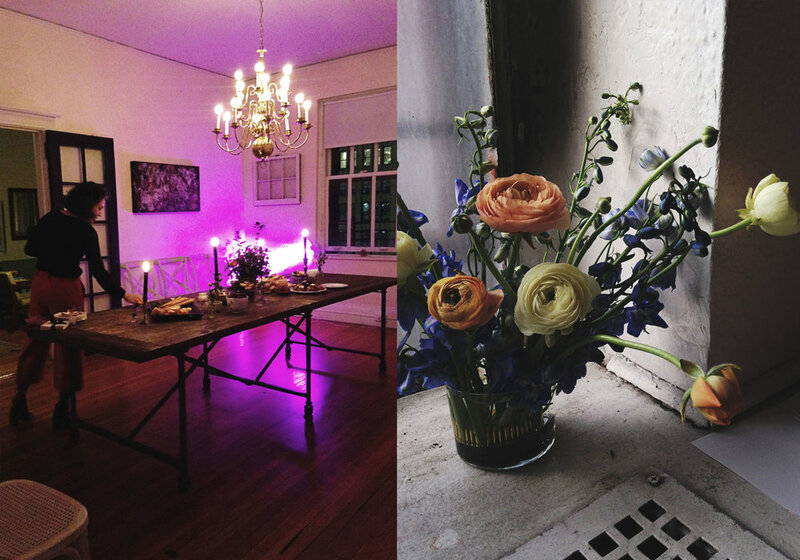 My artist collective, LittleJoy NYC, has a Winter Blooms & Luncheon coming up. Planning for this and the entrepreneurship involved is time consuming, but fun. I like inviting people to share in the interesting projects we have going on. I've picked up practicing the floral art of "Ikebana" which is a Japanese method. The method requires the use of weighted pin heads (which Americans hilariously and historically have named 'floral frogs'?). It's a beautiful method that is more than simply putting cut stems into a pool of water. It is a discipline with a philosophy of bringing humanity close to nature. I love the Japanese way of holding nature in high regard. There is such a respect in Japan for the rhythm and order of nature. It seems only natural that this regard carries over into their floral arranging. Another really beautiful thing I love about Ikebana is the fact that asymmetry is a key element. I really hold on to this because I truly believe that nothing can ever be perfect on this earth! There is a reality there. I like to embrace imperfection. Transcendent, divinity is perfection -- but we are not that and I kind of like it that way. It makes everything all the more significant and unique. I was telling my friend Alex and Mackenzie the other night about Ikebana and how it involves sometimes creating the shape of a scalene triangle. Scalene! We all had a good laugh about that word. We haven't said it since high school.